You have an Exchange 2010 SP1 organization with the following configuration: Server1 roles – mailbox, hub transport Server2 roles – client access server Server1 holds the public folder database. Which command would you use first to remove public folder database? You have to remove all the public folders from a public folder database before you remove the database. Remove-PublicFolder -Identity “\My Public Folder” -Recurse: $True Then, before you remove the database you must make sure it is not the default public folder database for the mailbox database. If so, you must set another as default before removing it. You deploy a Monitor Server srvApp1. You want to allow the server to send notification mails to an administrator through the relay domain. Which option should you use? D. From the EMC, select the Email Address Policies tab, rightclick Default Policy, and then click Apply. When going from Exchange 2003 to Exchange 2010, you’ll want to upgrade the default email address policy. To do so, you must run the following command: Set-EmailAddressPolicy “Default Policy” – IncludedRecipients AllRecipients Once upgraded, you’ll be able to use the EMC to manage it. Your company has an Exchange Server 2010 Hub Transport server named Hub1. Hub1 receives all email sent to the company from the Internet. You install the antispam agents on Hub1. You need to ensure that Hub1 only accepts messages sent to email addresses listed in Active Directory. What should you do? The Mailbox servers are members of a database availability group (DAG) named DAG1. You need to configure DAG1 to use a static IP of 192.168.1.100. Which Windows PowerShell cmdlet should you run? You have an Exchange Server 2010 Service Pack1 organization. The organization contains a Hub Transport server named Server1 and an Edge Transport sever named Server2. All servers are configured to use an internal DNS server named DNS1 for host resolution. You configure an Edge Subscription from Server1 to Server2. You need to modify the delayed acknowledgment (ACK) setting of Server2. What should you do? You have an Exchange organization. All servers in the organization have Exchange Server 2010 SP1 installed. You need to ensure that an administrator can recover hard-deleted email messages from a user’s mailbox until the deleted item retention period has elapsed. All expired email messages must be deleted when the retention period has elapsed. What should you do? A. From the Exchange Management Shell, run Set-MailboxDatabase -DumpsterStatisics $true. B. From the properties of the mailbox database, select the This database can be overwritten by a restore check box. You have an Exchange organization. All servers in the organization have Exchange Server 2010 SP1 installed. An external user reports that when he sends email messages to the organization, they are not received. You suspect that the email messages he sends are getting incorrectly identified as spam. You need to identify which anti-spam filter is blocking the email messages. What should you do? You have a hosted Exchange organization. All servers in the organization have Exchange Server 2010 Service Pack 1 (SP1) installed. You have 3 mailbox servers in a DAG. You want to enable Datacenter Activation Co-ordination on exiting the DAG. Which cmdlet should you use? Datacenter Activation Coordination (DAC) Mode is a property of a DAG which can be turned on or off. DAC mode is disabled by default and should only be enabled for DAGs with three or more DAG members that have been deployed in a multi-datacenter configuration. DAC mode shouldn’t be enabled for 2 member DAGs where each member is in a different AD site 2-16 member DAGs where all members are in the same AD site. 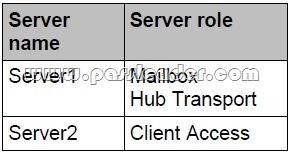 You have an Exchange 2010 SP1 organization, with servers in the following configuration: Server1 – Mailbox, Hub Transport server. Server2 – Client Access server. Server1 holds the public folder database. You deploy a new server named Server4 and Outlook 2010 clients. Which command would you use to ensure that all new public folders are created only on Server4? We have a server that will need to send emails to an external administrator. We would have to build a Receive connector for use by that server. A. On Server1, set the authentication type for the Microsoft-Server-ActiveSync virtual directory to Integrated Windows Authentication. C. From the Exchange Management Shell on Server4, run New-ActiveSyncDeviceAccessRule – QueryString * -Characteristic DeviceModel -AccessLevel Allow. D. From the Exchange Management Shell on Server3, run Set-ActiveSyncVirtualDirectory – Identity”Server3\Microsoft-Server-ActiveSync (default web site)” -Basicauthentication:$true. You work as the Enterprise Exchange Administrator at ABC.com. The ABC.com network consists of a domain named ABC.com. The ABC.com network has a mail server named ABC-EX01 that has Windows Server 2008 installed. You receive instruction from ABC.com to deploy Exchange Server 2010 on ABC-EX01 to support the following roles: Hub Transport role. Client Access role. Mailbox role. Unified Messaging (UM) server role. What action must you take?